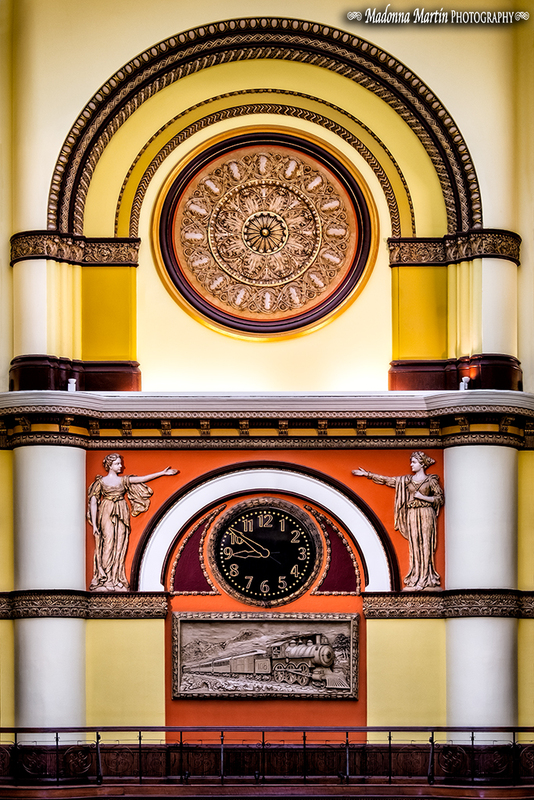 The Union Station in Nashville was built and used in an era when train travel was elegant and passengers worn their Sunday best clothes. Construction of the station began in 1898 and completed in 1900. Structural elements include Victorian and Gothic designs. My photo above features architectural details at one end of the atrium, including a gold-leaf medallion. The facility closed in 1969 and went through a long period of abandonment. It was finally converted to a luxury boutique hotel in 1986, and further renovated and rededicated in 2007. Marriott proudly lists this property as an Autograph Collection Hotel. The accommodations here are too pricey for my budget. However, I was able to photograph the interior briefly during a photography workshop in 2015. Beautiful! I bet it was a grand sight, back in the day! How wonderful that it has been re-purposed rather than left to deteriorate and eventually be torn down.